Dinosaur Comics - August 6th, 2009 - awesome fun times! –"Oh, you'll grow out of that!" August 6th, 2009: Here's another comic for you to read! Three Word Phrase, a fun comic by Ryan Pequin, who you may already know from his Hourly Comics! Niiiice. Also! 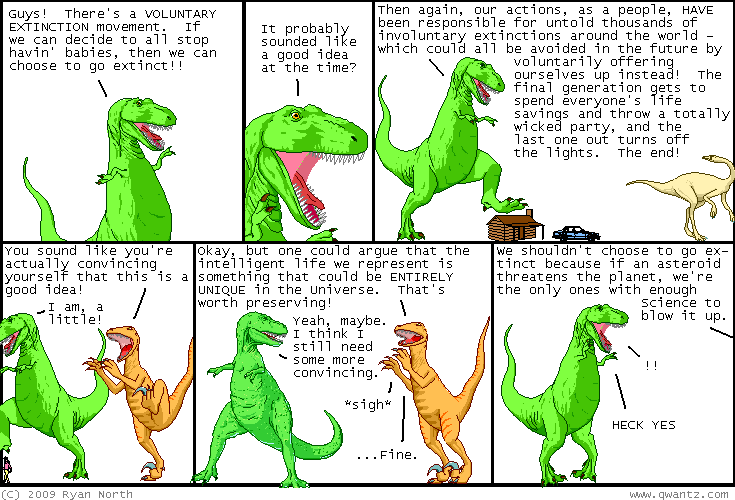 God and T-Rex and Dromiceiomimus and Utahraptor talked about money the other day, and how good (or not!) it is at making people happy. Ecocomics ("Where Graphic Art Meets Dismal Science") posted some pretty rad words about it, talking about diminishing marginal utility. Check it out - the other posts in Ecocomics are fun too! "The concept of declining marginal utility isn't limited to money, either; as the quantities of anything go up, each successive unit is probably worth less to the recipient than the last. If, for example, I met you on the street and said, "Hi, Ryan, let me buy you a hot dog," you might be delighted. If, when you were done, I said, "Let me buy you another one," you would probably be less so (depending on how hungry you are, and how much you like hot dogs). Eventually, if I kept buying you hot dogs, you would reach a point - no matter how much you like hot dogs - where the magic of free hot dogs would fade."